What is still not clearly established is whether fluoridated water, consumed over a lifetime, may lead to at least the initial stages of skeletal fluorosis. A threshold intake amount of 10 milligrams (mg) fluoride per day for an adult for a decade or two has been suggested as necessary before skeletal fluorosis is likely to result. Do Americans get this much fluoride? No sufficiently large study has ever been conducted in the US to determine the total intake of fluoride. However, a recent British study looked at a biomarker for fluoride intake, which is the amount of fluoride excreted over 24 hours in urine. It found that several percent of adults were likely already exceeding an intake of 10 mg/day. The situation may actually be far worse in the US, since in Britain, only 10 percent of the population has fluoridated water, whereas in the US over 65 percent does. Fluoridated water was an important contributor to the high fluoride intake among some individuals in the British study. Skeletal fluorosis was identified in a 2006 report by the National Research Council (NRC) as an adverse effect that needed to be considered by the EPA in establishing maximum safe levels of fluoride in drinking water. But so far, the EPA has done no serious analysis of the potential for skeletal fluorosis in the US. The NRC report had even more concern for another effect of fluoride on bone, which is the decrease in bone strength that can result inhigher risks of fractures, especially in the elderly. This effect has not been as well studied as skeletal fluorosis, but since fractures of the hip in the elderly are such a serious health problem, often sending patients into a spiral of declining health ending in death, it is crucial to know whether water fluoridation is contributing to decreased bone strength. Some basic information about how fluoride acts in your body is helpful to understanding its health effects. First, about half of the fluoride you consume is excreted through your kidneys into your urine, while the other half becomes bound in your skeleton. 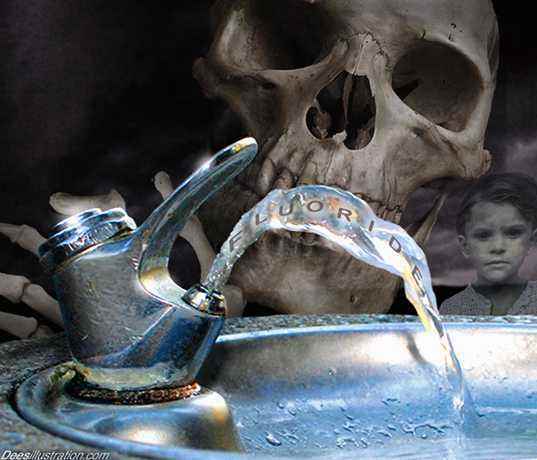 The fluoride that enters your bones is eliminated very slowly. The NRC estimates the biological half-life of fluoride in bone (the time for half of it to be removed) is as long as 20 years. Unfortunately, most people—especially if you're drinking fluoridated water on a daily basis—have constant low level exposures to fluoride, they are taking more fluoride into their bones than what is being removed, so the level of fluoride in their bones increase steadily over time. Young people generally don't have more than a few hundred parts per million (ppm) of fluoride in their bones, whereas older people living in fluoridated areas can have several thousand ppm, which is the level where skeletal fluorosis begins. Fluoride excretion in urine is reduced in those with decreased kidney function, which is also very common in older people. So, the elderly not only have accumulated higher levels, but they are losing the ability to effectively remove it as well. An analogy can be made between fluoride accumulating in bone and persistent chemicals such as dioxin or PCBs, which often accumulate, because they also have long biological half-lives in human tissues. Your bone is constantly being "turned over" in a process called remodeling. The mineral portion of your bone is broken down by one type of cell and then rebuilt by another. Fluoride appears to interfere with this essential process. The result is excessive mineralization and enlargement of your bones, and a disruption of the precise architecture needed to maintain resistance to fracture. Can Therapeutic Doses of Fluoride Cause Osteoporosis? Supporting this are human studies performed, given therapeutic doses of fluoride to try to prevent fractures from osteoporosis, which causes low bone density, often have found increases in fracture rates in the treated patients, even though their bone density increased. So, the important scientific question is whether water fluoridation can lead to high enough levels of fluoride in your bones to noticeably weaken them. A dozen or so epidemiological studies have investigated this, with mixed results. Some of them show that fairly low levels of fluoride intake can increase the risk of fractures, whereas others have found no effect. An important recent study tried a different approach. Instead of looking at the rate of fractures in people exposed to varying amounts of fluoride, it used samples of actual bone from people undergoing hip replacement to see whether the bone fluoride concentration correlated with the mechanical strength of those samples. This type of study had been done on laboratory animals, but never in humans. The work was completed in 2001 but was not published until 2010. The number of subjects in the study was small, with only 92 people, so the results were not definitive. The authors themselves do not draw any firm conclusions. Yet when the results are examined carefully, there is clear evidence that the people with higher bone fluoride levels had weaker bones, by several different measurements of bone quality. The most straightforward measurement of bone strength was the amount of compression force the sample could withstand before breaking, which is called the Ultimate Compressive Stress. The people with the highest levels of fluoride in their bone had their sample break under about 50 percent less stress than those with the lowest levels of fluoride. This result was statistically significant. A serious limitation of the study was that it failed to control for age, even though it found that older people tended to have weaker bones. The problem is that since older people also tend to have higher bone fluoride, to disentangle the effect of fluoride from that of age, they should have controlled for age in some manner. For example, they could have looked at a relatively narrow age range subgroup of their subjects to see if the relationship between fluoride and bone strength could still be detected when age was "held constant". Other, more sophisticated methods of controlling for age are also possible. Government funding for research on fluoride has a history of granting money only to researchers who defend fluoridation, so the decision to leave this study ambiguous may have been to avoid a cut-off in future research dollars. Another 2009 study suggests that fluoridated water might also be causing bone changes in young people, long before the bone fluoride concentration reaches the high levels in later life. Several types of bone mineral density measurements (BMD) were made in 11 year olds and related to fluoride intake. Several associations were found. In girls the BMD tended to decrease with higher fluoride intake, while in boys it tended to increase. The number of children in the study was relatively small and the effects were generally weak. The study didn't try to find out whether these changes in bone had an effect on fracture rates, however. It is worth noting that the Chachra study on bones of hip replacement patients also found only weak associations between fluoride and BMD, yet found a clear association between fluoride and bone quality. So the fact that Levy's study only found weak associations between fluoride and BMD doesn't preclude the possibility that fluoride in children may be more clearly affecting bone strength. Simply finding that water fluoridation may be sufficient to cause changes in bone remodeling at this age is worrying. Dental proponents of fluoridation typically ignore all effects of fluoride except on the teeth, or even maintain that there are no such effects. Clearly, the effect of water fluoridation on bone health cannot be dismissed as non-existent. When these recent studies are seen in the light of earlier work, the concern is heightened. In one of the best bone fracture studies on adults to date, it was found that hip fracture rates increased steadily starting from the lowest fluoride level examined, which was similar to what many Americans are getting from fluoridated water. In children, one of the only studies ever conducted looked at fracture rates in relation to dental fluorosis . Dental fluorosis is disrupted enamel development that occurs in children exposed to fluoride. This study found that bone fracture rates rose sharply with increasing severity of dental fluorosis. In the US today, roughly 40 percent of all children have dental fluorosis, and several percent have the more severe stages. This biomarker of childhood fluoride exposure tells us that overexposure and the accompanying risk to bone health starts early. Although not discussed in this article, the health effects of fluoride ingestion are numerous. For a list of documented health effects, please see FAN's Health Effects Database. The science is quite clear: Fluoride should NOT be ingested. So, first of all, don't drink fluoridated water. You can remove about 80 percent of the fluoride from your drinking water using a reverse osmosis (RO) filter. It is really hard to remove all of it with virtually any commercial filter. If you are concerned about fluoride the BEST solution is to help the Fluoride Action Network in their campaign to remove it from the water supply entirely. You're even exposed to fluoride through air pollution! For more information about airborne fluoride pollution, please review FAN's Fluoride Pollution page. Important! The producers of this powerful film are allowing a full and FREE preview through August 13th in celebration of Fluoride Awareness Week (Aug 7 - 13)! You can support Fluoride Action Network by purchasing the Professional Perspectives DVD at a special price of $10 during Fluoride Awareness Week. The Fluoride Action Network has a game plan to END water fluoridation in both Canada and the United States, and this Fluoride Awareness Week will hopefully bring us a lot closer to that goal by spreading mass awareness. Our fluoride initiative will primarily focus on Canada since 60 percent of Canada is already non-fluoridated. A few weeks ago the city of Calgary stopped fluoridating over a million people and last October the citizens of Waterloo, Ontario voted it out in a referendum. If we can get the rest of Canada to stop fluoridating their water, we believe the U.S. will be forced to follow. Please, join the anti-fluoride movement in Canada, New Zealand and the United States by contacting the representative for your area below. If you live in Ontario, Canada, please join the ongoing effort by contacting Diane Sprules atdiane.sprules@cogeco.ca. New York City, NY: With the recent victory in Calgary, New York City is the next big emphasis. The anti-fluoridation movement has a great champion in New York City councilor Peter Vallone, Jr. who introduced legislation on January 18 "prohibiting the addition of fluoride to the water supply." The point person for this area is Carol Kopf, at the New York Coalition Opposed to Fluoridation (NYSCOF). Email her atNYSCOF@aol.com . Please contact her if you're interested in helping with this effort. San Diego, California: Contact Patty Ducey-Brooks, publisher of the Presidio Sentinel at pbrooks936@aol.com. Check out FAN's Action Page, as they are working on multiple fronts to rid our food and water supplies of fluoride.